After graduating from dental school in 2000, Dr. Elizabeth Schmahl accepted a residency in the state of Arizona. She worked with the Indian Health Service on the Tohono O’odham reservation. Making a four-hour round-trip commute to Sells, Arizona every day, Dr. Shcmahl gained experience with a variety of dental conditions and provided help and hope for people who really needed dental care. Because many of her cases had complex medical conditions, Dr. Schmahl realized the value of comprehensive dental treatment and strived for a better quality of life for her patients by minimizing dental pain and infection. This is a philosophy that has become a large part of Dr. Schmahl’s practice goal for every patient. 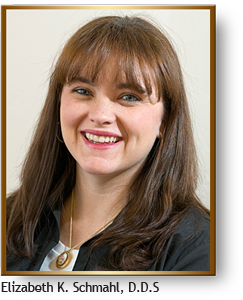 In addition to her residency, Dr. Schmahl had experiences with service-oriented dentistry. She says, "I pulled my first tooth while on a missions trip in Lima, Peru. The only operatory light we had was a garden variety flashlight and our dental chairs were no other than the pews inside the local church!" On a separate trip, Dr. Schmahl, along with a team of dentist colleagues and medical doctors, provided free dental care to needy children in several orphanages in Santa Cruz, Bolivia. Upon leaving Santa Cruz, Dr. Schmahl’s most cherished souvenir was a hand-painted picture that one of her patients gave her as a thank-you. This special little painting still graces the wall in her home to this day!"